Photos available. Contact media@k-state.edu or 785-532-6415. MANHATTAN -- For Kansas State University's grounds department, the word "green" is loaded with meaning. It refers to the plants and flowers used to beautify campus, the way crew members have been getting to their job sites, and the "green" this approach is saving the university. 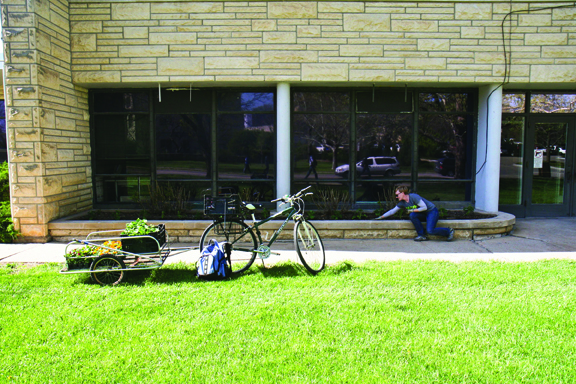 For the second spring in a row, K-State personnel responsible for seasonal planting will ride their bicycles to the 65-plus beds and planters scattered across campus, a move that was borne out of necessity. Last year, members of the university's planting crew were having trouble figuring out the best way to get labor and materials to each of the beds on campus in a timely fashion. During the summer the department has several student laborers and coordinating everyone's efforts can be a bit of a challenge. "We have some pretty old equipment around here and sometimes it can be pretty unreliable," said Joe Myers, head of grounds maintenance for K-State. "Some of the student employees on the flower crew thought that they could handle everything on a bicycle." "With what other job can you say you get exercise while working," said Annette Finkeldei, a senior in horticulture, Manhattan, and leader of the student flower crew. "It's great because I don't have to carve out a part of my day to stay fit like most people." On average, the bikers cover eight to 10 miles a day, which is about an hour in the saddle. Due to the program's success, it's been expanded this year. Myers has been actively working with the campus police department to collect bikes abandoned on campus and, during the winter months, he enlisted some of his colleagues to build trailers for the bikes made mostly out of materials the department already had. This season, the grounds crews will have a couple more bikes, and the bikes will pull trailers big enough to carry flowers and gardening tools. The trailers are also wide and low enough to carry a push-type lawn mower. That means students on the "detail crews" will be encouraged to ride a bike instead of firing up a utility vehicle, Myers said. "Anything we can do to make the time spent shuttling students around and have a positive impact on the environment, we're all for it," Myers said. In addition to saving time and a little bit of the environment, Myers said it also has saved his department some money. Last summer when gasoline prices were spiking, Myers estimates that the bikes saved the grounds maintenance unit roughly $400 in gas. With budget cuts and the university's growing emphasis on sustainability, Myers said he hopes to see other departments and units on campus follow their lead.